Lots of communications asking for lifestyle change use emotional blackmail to inspire change: Polar Bears on ice are a good example. Our previous post about Chris Jordan’s Midway Island photographs of dead and decaying albatross chicks with stomachs full of plastic is another. But they don’t always work as well intended – they focus too much on far-off non-personally-attributable effects and not enough on close-to-home personally-achievable actions. The Fun Theory is an evolving Swedish campaign for VW that expresses ‘fun’ in real-world public events: turning dreary train station stairs into a massive piano, or a public bin that creates the effect of rubbish falling into a deep hole. 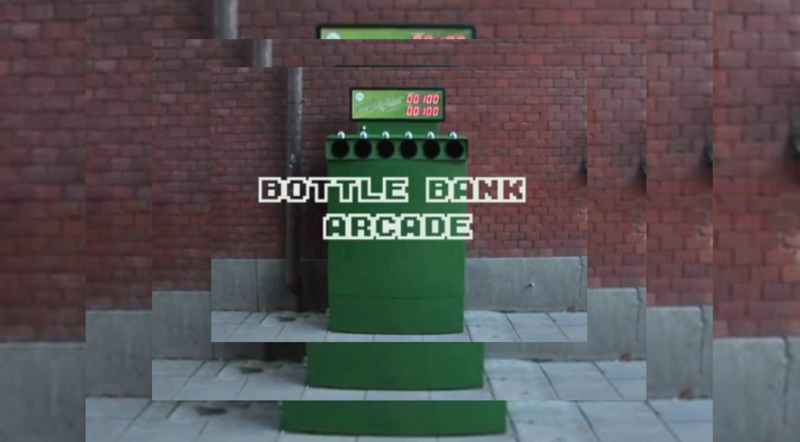 They’ve now made a Bottle Bank Arcade Machine – a recycling bin for Sweden’s less frequently recycled glass bottles (they don’t get money back for recycled glass, unlike plastics). What a wonderful, simple, and engaging way to get people to do the right thing. A similar effort from The Fun Theory collection in Sweden is the ‘Världens Djupaste Soptunna’, or the ‘World’s Deepest Bin’. To paraphrase, they asked: ‘Can we get more people to throw rubbish into a bin, rather than onto the ground, by making it fun to do?’ The response was a standard waste bin in a public park rigged with all the necessary electronic equipment to express a cartoon-style sound of an object falling from a great height, triggered by every waste disposal effort. This Världens Djupaste Soptunna collected nearly twice as much litter as a nearby undoctored litter bin (72 kg versus 41 kg). However, this seems to be less about encouraging use than it is about reinforcing use for those who engage: the unheard sound fails to ‘prime the pump’ as effectively as the Bottle Bank Arcade Machine. Having said that, park visitors who were engaged appeared to search for more litter once they realized disposal triggers the cartoon sound – some rifled through their bags to find more. This challenges the commonly held schema that litter bins are to be avoided because they are smelly and full of germs, and goes some way to creating a hyper-local norm of frantic litter-picking. In practice, the bin creates unwitting Park Keepers of the participants by elegantly rephrasing the question ‘Would you like to be on litter duty?’ That’s no mean feat. In Berlin, Germany, they have aural bins too, except these ones say either ‘Vielen danke/Thank you’ or ‘Welcome to Berlin’ when you deposit an item of rubbish. Sepp Fiedler works at the company behind the idea. He says in conversation with CNN: ‘The people like it. They pass them on the streets and start laughing because it’s unusual to have this sort of contact with a litter bin’ – which is a perfect description of the schema-busting powers of fun and surprise that these talky-bins deliver. Kevin Richardson is a producer for MTV’s Nickelodeon channel. His day-to-day work requires him to use, hone, and develop his storytelling skills – something he’s familiar with and good at. He saw Volkswagen’s Fun Theory call for entries and set about creating his solution to speeding. Good reasoning – but how do you execute it? With the ‘Speed Camera Lottery’. Kevin’s approach is simple – those who are on or under the speed limit are entered into a lottery to win about £3,000 taken from the fines generated by the speed camera, with the ‘entrance ticket’ an automatically taken photograph of their car’s number plate. It neutralises temporal discounting by creating a winner’s pot large enough to satisfy us with the potential future ‘gain’. Although (in a hushed voice) it does incentivise repeat drive-bys which will increase road traffic. It really is hard to ask with the right incentive (just ask Joshua Gans of potty-training fame). Fun Theory work is… fun. But it is hard to deliver change in behaviour that is persistent and ubiquitous and doesn’t have unintended consequences or be poorly measured. Of course, at the Hunting Dynasty, we know how to get it right (have a look at the recent posts on this blog – and here’s a great behaviour-change letter from World War II!, and more information on ‘The ABC of RCTs’, and on sample size for tests (‘How many people do I need to test on? (Answer: It’s not as many as you think. )’)).